It is not unknown that for a long time the Chilean community living abroad has closely followed news from Chile. Above all, they have made known their support or rejection in matters that concern the country. From environmental conflicts to the student movement, the Chilean community has shown their support. As a result, letters or a photographs in an emblematic place where they reside, has been the most common forms of support. For example, among the places where Chilean communities reside that have participated in this initiative, Europe and North America stand out. In addition, they organized themselves through social networks to carry out their support activities with the community residing in Chile. According to the results of the Second Registry of Chileans abroad, the population living outside our borders rose to 1.037.346. From that total, only 2.959 live in New Zealand. 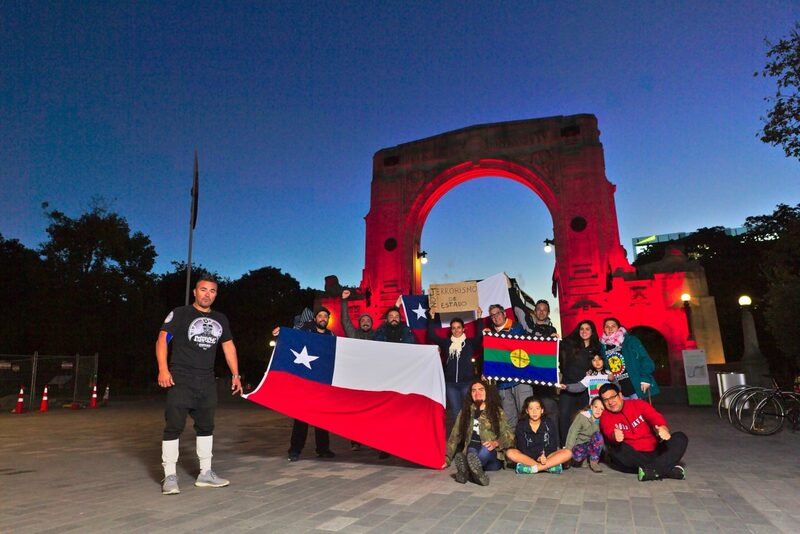 This country opened its borders in a gesture of solidarity with the Chilean people. In others words, New Zealand gave us a hand when Chile went through a tough dictatorship in the 70’s. As a result, the Chilean community has settled in these distant lands and they has created Latin communities throughout the country. Christchurch, considered the third largest city in the country, host an important number of Chileans and Latinos. Considering my experience photographing social movements in Chile, I had an idea. 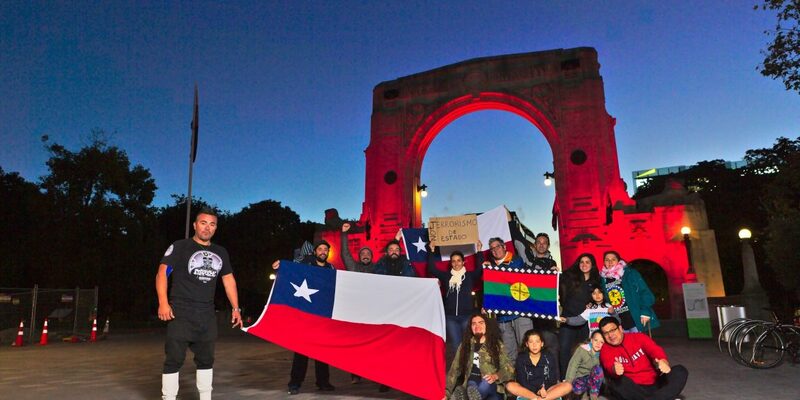 I proposed to the Christchurch’s Chilean community, a symbolic gesture to support the Mapuche people. To clarify, the inspiration for this idea came from similar activities made by others Chileans community living abroad. I became part of those thousands of Chileans living away from home. I know how the community feels about issues of abuse and injustice. We need to point those abuses out and learn to respect or native people. The best way to do this, is giving a good example to others and standing up for what you believe. The news chocked me. Due to a council order, the police abused thirty Mapuche women who were selling veggies by the street in Temuco, Chile, without reason. They crushed their goods on the ground and took 18 people in detention. Certainly I thought what’s going on there? Why is this happening? Therefore, I decided to do something about it. The idea of a symbolic support towards Mapuche women took shape. I am very happy that several people supported the idea, so I created an event on facebook. We gathered at the arc of the remembrance at town to take a group photo and demonstrate our support. I do believe that is important talk about this situation among the Chilean community residing here in Christchurch. We need to do something else that just share news on social media networks. That afternoon , we caught the attention of many people who passed by. Suddenly a pedestrian approached us to ask what we were doing. Turned out to be a Chilean and he gladly joined us in the activity. Mapuche means “people of the land” in their language, Mapudungun. Their territory once stretched from the Pacific coast and islands of Chile across the Andes into Argentina. They defended that land from the Incan and Spanish empires. Unfortunately in the 1880s, the Chilean and Argentine armies defeated the Mapuche. The Mapuche conflict dates back hundreds of years ago. Since the return to the so-called democracy in 1990, the conflicts between government and Mapuche has increased exponentially. As a result, the Araucania region in Chile is a militarized area. The repression and humiliation against mapuche people from the government, have been systematic because they want to recover their lands. The Mapuche are still fighting for recognition, now against Chile’s two biggest forestry companies, government obduracy, and an anti-terrorist law drafted by the Pinochet regime. As a result of this fight, several mapuche leader resulted killed: Jaime Mendoza Collio, Matias Catrileo, Jose Huenante, Alex Lemun to name a few. It is regrettable that the response from the government is the police reinforcement in the area instead the dialogue. Further more, the application of the antiterrorism law to Mapuche leaders is completely abusive. That law have the sole objective of persecuting and annihilating opponents of the regime (dictatorship back on the 70’s & 80’s). There’s no reason why this law should be applied to mapuche leaders. Since then, this law have been applied to mapuche people only. Today we know that many cases in which the antiterrorism law was applied , was a montage from the police. This horrible strategy is used to imprison innocents Mapuche leaders. Everything was uncovered after the scandalous Operation Hurricane. Police were guilty of creating false evidence against mapuche leaders to put them in jail. We are very aware that the Mapuche conflict is complex. We don’t understand the lack of willpower from the government to look for alternative solutions other than an all guns blazing method. I would like to see a kind gesture from the government toward the Mapuche people. I’d like for our government to recognize and respect them as a native and autonomous people. In a similar way as New Zealand did with the Maori people. The way in which the Maori people and the government of New Zealand have advanced in resolving their conflicts, is considered as a model that could be useful in the case of Chile with the native people that inhabit the territory.